Although this poster isn't aimed at Australians, it's interesting to see the way we're seen from some foreign eyes. 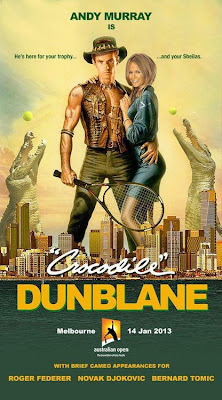 Essentially an exploitation film, Crocodile Dundee has about as much to do with the Australian way as summer in July. Its all but a distant memory here. Paul Hogan's last TV appearance was in fighting the Tax Office in court, and I doubt any of the Crocodile Dundee movies even made to DVD from VHS. The only aberration was the embarrassing and ill fated bid for the 2022 FIFA World Cup which used Croc Dundee in what can only be assumed was an attempt to sell Australia as a bunch of simpletons and bushmen who want the World Cup. Obviously that bid was laughed out of the FIFA offices when it was time for the adults to get serious. Not too sure about the tag line either: "He's here for your trophy... And your Sheilas"
The last time Australia could consider the trophy as 'ours' was in 1976 when Mark Edmondson won it. So unless Murray is looking to take on a former winner for a 37 year old trophy, he best look to take the title from fellow European and 2012 winner Novak Djokovic, rather than any Australian. But if Murray is only about beating the Aussies he's only got Tomic and Hewitt, who not even the most one-eyed Aussie tennis fan could say are contenders. Surely the world number 3 has bigger objectives? And Australia's relationship with Tomic and Hewitt is at best one of cautious tolerance - people kind of want to like them, but the next tantrum is always just around the corner. And as for the Sheilas? Murray is more than welcome to them. He'd just have to visit the set of Neighbours in 1988 which was the last time a woman referred to herself as a Shiela. But I'm thinking both Murray and his long term girlfriend, Kim Sears, might not be completely ok with the idea of sharing the hotel room with a moccasin wearing, permed up sheila drinking Westcoast Cooler and smoking Winnie Reds. Still, its all really about setting up some friendly rivalry in the tournament. Britain vs Australia is probably a better sell than Scotland vs the Swiss and the Serbs. The only problem is that most Australians would like to see Murray win just as much as the Brits do!